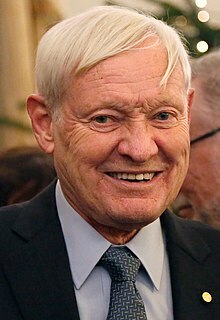 Joachim Frank (born September 12, 1940) is a German-born American biophysicist at Columbia University. He is thought to be as the founder of single-particle cryo-electron microscopy (cryo-EM). He shared the Nobel Prize in Chemistry in 2017 with Jacques Dubochet and Richard Henderson. He also made major works to structure and function of the ribosome from bacteria and eukaryotes. ↑ Frank, Joachim (2017), Curriculum Vitae. Retrieved October 4, 2017. ↑ "The Nobel Prize in Chemistry 2017". The Nobel Foundation. October 4, 2017. Retrieved October 6, 2017. This page was last changed on 21 October 2018, at 23:53.